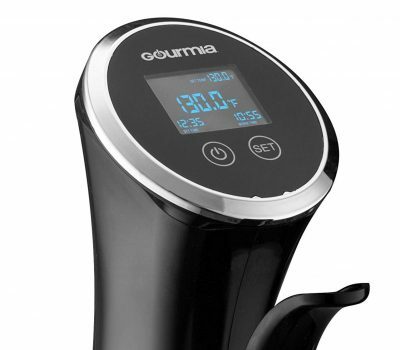 The Gourmia GSV138 Sous Vide is a new model that improves upon their older products. It has all the same power and quality in a new more modern package. $69.99 Current Price - YOU SAVE $37.33. 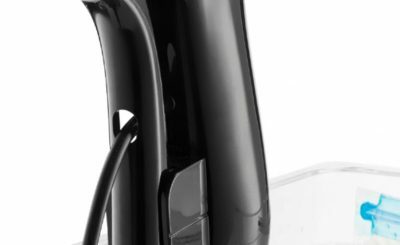 The Gourmia GSV138 Sous Vide is a newly redesigned unit to replace the aging GSV130. It features an improved sleeker design with all of the high quality you've come to expect. We think this is a great option to choose. This model has specifications, controls, and display that look suspiciously similar to the NutriChef Sous Vide PKPC120BK and we suspect they are the same model on the inside. The Gourmia costs $69.99 and the NutriChef model currently costs $74.00 we suggest choosing whichever one has the best price. The Gourmia GSV138 Sous Vide Precision Cooker is 16" tall making it taller than most models we reviewed. The control unit is made of high impact polycarbonate material, and the heating element is encased in a stainless steel tube, overall the unit felt very high quality, well made and dependable. It featured and alligator style clamp, which makes it very easy to set up or takedown. Alligator style clamps don't give you as much flexibility to adjust the unit vertically. For extended cooking projects this means you will have to be more mindful of the water level. This model is rated at 1200 watts of power putting it at the very top for all of the models we reviewed. The flow rate is 1.5 GPM which is just below the average of 2 GPM. This gives you a nice balance of being able to heat up quickly but not too much circulation causing water to evaporate too quickly. We really were impressed with how quickly this model was able to get the water up to temperature, it was much faster than everything else we tested. The controls for this model are on the face set at a slight angle making it easier to read. The LED display has a large center temperature which displays the current temperature of the water. In the upper right is the set temperature, which is readable but a little smaller than we would have liked. You set the temperature using a scroll wheel that's located on the back of the control head. It's a little awkward because you have to feel around for it, but it's not a deal breaker. Setting the timer will give you a headache we don't even recommend that you try, just use a standard kitchen timer instead. This model does not have Bluetooth or Wifi Connectivity and does not connect to an Amazon Alexa. This Gourmia GSV138 Sous Vide really is good quality sous vide unit that has just about every feature most people are going to be looking for. The clamp isn't our favorite, and the scroll wheel used for the temperature control is clumsy, but it makes up for it in quality construction and dependability. We really liked this unit and think most people will be very happy with it.